Uttar Pradesh: The scene at the wheat fields along the national highway in Basai village was gory on May 2 morning. Villagers going for work saw five bodies soaked in blood. Vijay Singh, Jaipal Singh, Satbir Singh and SugreevÑall Dalits of the villageÑwere dead, but another Dalit, Santhosh was still hanging on to life, though his neck had a deep gash. He was rushed to hospital. The five men had gone to the neighbouring Alai village for work on May 1. "It looks like they were tortured before they were killed," said Nihal Singh, an elderly villager, pointing to the marks on the bodies. When a police constable's cap was found under Vijay Singh's body, all hell broke loose. To make things worse, a group of policemen turned up and began lathicharging the crowd. They did not let the relatives take the bodies for funeral. When the villagers refused to move the police opened fire killing one person. 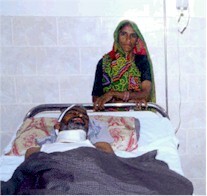 Varsha, Jaipal's wife, broke her arm in the melee. Even the pregnant wife of Sugreev was not spared. "We were kicked on the abdomen and pulled by the hair and we fell unconscious," said Varsha. Hari Singh, Vijay and Jaipal's father, believes that the police are the killers. "Probably the police wanted them to confess to something. When they did not, the police shot them and dumped them in the field," said the old man, choking with emotion. Hari Singh was denied access to the postmortem report. He claims that the police threatened him when he tried to lodge a complaint against the officers of Tundla police station. "If I dare to speak my entire family may be bumped off," he said. The lone survivor Santhosh, who is recovering at Goel Nursing Home in Agra, is unable to speak. His wife Munni is too scared to speak out. She also fears that once he leaves the hospital he would come under pressure to hush up the matter.